The First Christian Church of Pomona was organized in the summer of 1883 by a group of “Christians” who had emigrated west to California. The church gathered with a small group of families for Bible study, fellowship, and weekly observance of the Lord’s Supper (Communion). Within a few months, the congregation had grown enough to call its first Pastor, William T. Tibbs, who began his ministry in October of 1883. By the end of that year, the congregation had secured property to build its first building, which was completed in 1886. Tibbs served the congregation until 1891 when Frank M. Dowling was called to be pastor. The congregation was outgrowing its building so the congregation commissioned work to begin on a new building which was dedicated on February 26, 1891. Over the next twenty years the church continued to grow with Pomona. A series of successful pastors led the congregation to once again outgrow its facility. 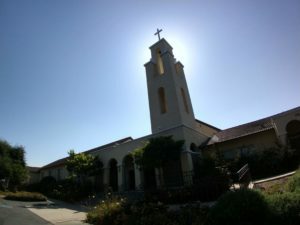 The church elected to build in another location near the then civic center of Pomona at the corner of Main and Center Streets. The third building was dedicated on June 5, 1910. With the advent of this third phase of ministry, the congregation threw itself into the missionary zeal of the early part of the twentieth century. The congregation commissioned missionaries and ministries to the Congo in Africa, to Tibet as well as local endeavors. The congregation worked to improve the lives of farm workers, particularly Chinese and Phillipino immigrant farmworkers who worked in the citrus industry. The congregation flourished in its third location until in the early 1940s when they outgrew the building. The congregation elected to move, this time to the edge of the city, and bought 5 acres of citrus groves, building their fourth building, our current location, which was dedicated in 1951. The Christian Church (Disciples of Christ) is a Protestant denomination of approximately 411,140 members in the United States and Canada. It’s one of the largest faith groups founded on American soil. Alexander Campbell was born September 12, 1788, in the County of Antrim, Ireland. He was raised as a Presbyterian. He attended the University of Glasgow, Scotland.